Jul. 26, 2017 5:00 p.m. The second of two new fire stations in Red Deer officially opened Wednesday as Red Deer Emergency Services turned up the heat at the grand opening of Fire Station #3 next to the Collicutt Centre. “Today’s a great day. This has been a vision that has been decades in the making. 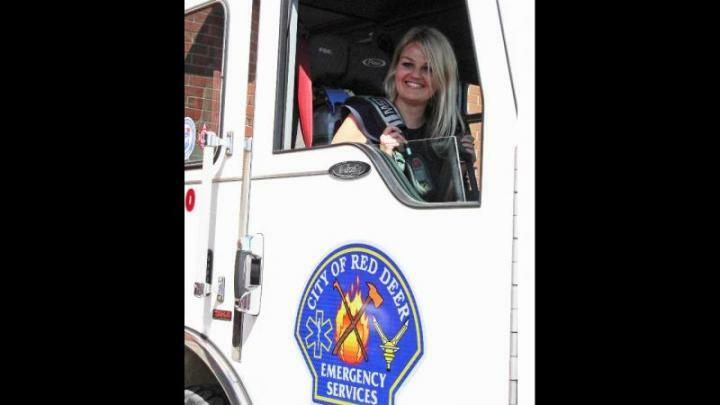 Ultimately, Red Deer has grown and developed so much over the years that we needed to approve new fire stations in order to continue to grow as a community,” said Mayor Tara Veer. They have adopted the provincial High Intensity Residential Fire (HIRF) standard, and for them to do that, she said, they needed to build new stations in order to facilitate growth and development in the community, but first and foremost to ensure the safety of the Red Deerians they serve. The new station, located in the Lancaster neighbourhood in southeast Red Deer, opened with fanfare on July 26th as hundreds of residents from the community joined the celebration. Following a short ceremony, guests enjoyed tours of the fire station, a free barbecue and fun family activities. Sparky the Fire Dog joined Red Deer Emergency Services crews on site to talk to guests about the new station and to teach about fire safety. When council and City administration were evaluating the various options, Veer said they knew they needed two new fire stations in the City, but their locations were very strategically and intentionally chosen. The new location was selected based on projected growth and access to major roadways, minimizing response times. Red Deer Emergency Services follows the provincial standard High Intensity Residential Fires (HIRF) guidelines which call for a total response time of 10 minutes 90% of the time, including call handling, assembly or chute time, travel time and set up. Fire Chief Brian Makey said the station serves the area of the southeast portion of the City including Lancaster, Inglewood, Vanier and down into the Westerner. He said another fire station, in this case, did not mean more firefighters. The approximate cost, he said, for this station was around the $7.5 million mark, which was the same for Station #4. He said when it comes to parking, they don’t anticipate any parking issues right in front of the station and he addressed traffic in the area. He said it’s a lot of work putting something like this together, but that it feels good to see it completed. “You’re talking about 10 years in the making and the last three years when I was brought on as chief, this was one of the main projects and priorities that I had was relocating those stations, and it’s a great feeling to actually walk into a building and it’s open and it’s done. It’s just fantastic,” he said. This was the second fire station to open in the City this year, after the new Fire Station #4 in Timberlands opened in January. The station will also be home to the Red Deer Emergency Services Platoon Chief’s office, where the Platoon Chief will manage crews at all five stations, coordinating emergency response efforts across the City. Some of the features of the new station, which includes the added office and dorm space for the Platoon Chief, also includes an apparatus bay, turn out gear room, front entry vestibule and staff areas. The old Station #3 on 32 St. was transformed into Red Deer Emergency Services headquarters and will house administration and the fire prevention and training branch, as well as the regional 9-1-1 call centre.